In 2011, Klaas van Dijk, Sergei Kharitonov, Holmer Vonk & Bart Ebbinge published a papers in Dutch Birding, on Taimyr Gulls. Below, you will find the content of the first paper reproduced, with several more images added. View on Dikson, Taimyr, Russia, (73°30'N, 80°31'E). The rubbish tip attracts adults and sub-adults from mid-August onwards before they migrate further southeast. The Taimyr peninsula in the northern part of central Siberia, Russia, hosts a significant breeding population of gulls Larus that belong to the assemblage of large white-headed gulls. It is as yet unclear where these gulls spend the winter. Along with this, there is a lack of agreement about their taxonomic status. Genetic analysis has shown that they represent a distinct population, ie, with a measurable degree of genetic differentiation and without obvious introgression (Liebers 2000, Liebers et al 2001, Liebers & Helbig 2002, Liebers et al 2004). In this paper, we simply refer to this breeding population as Taimyr Gulls L taimyrensis (cf Filchagov et al 1992). The lack of long-distance ring recoveries is one of the reasons for uncertainties and confusion about the wintering areas of Taimyr Gulls. Grant (1982) states that the wintering range is not known but quotes Vaurie (1965) who suggested the Caspian Sea as wintering area. Cramp & Simmons (1983) indicate that Taimyr Gulls spend the winter along the shores of the eastern Mediterranean, in the Caspian Sea area, along the Arabian Sea to western India, and partly also along coasts in eastern Africa. Glutz von Blotzheim & Bauer (1982) mention that Taimyr Gulls may winter in roughly the same area but clearly state that firm data like recoveries are lacking. Both sources assume that Taimyr Gulls migrate in a south-westerly direction towards the Indian Ocean. Possible confusion in these regions with, eg, Heuglin's Gull L heuglini and Caspian Gull L cachinnans is one of the reasons for an unclear picture. Gulls and they mention two long-distance ring recoveries, both of birds which had migrated in a south-easterly direction towards the Pacific. Del Hoyo et al (1996) indicate that Taimyr Gulls spend the winter in the same area as shown by Cramp& Simmons (1983) but they state that birds breeding on eastern Taimyr winter along the north-western Pacific as well. In conclusion, not much is known about the precise wintering areas. We obtained new longdistance ring recoveries and the results are presented in this paper. We also present data on distribution and breeding biology and we give a description of the general appearance of adults, illustrated with photographs taken on Taimyr. It should be noted that Olsen & Larsson (2004) do not provide photographs of Taimyr Gull. The Taimyr peninsula is the northernmost region of mainland Eurasia (figure 1). It covers more than 400 000 km2 and lies between 69°N and 77°N, and it stretches for 1000 km from the Yenisey bay (80°E) eastwards to 114°E. Almost the whole of Taimyr is situated in the tundra zone. Many international ornithological expeditions to Taimyr have been undertaken since 1989. Taimyr Gulls were studied and ringed during many of these expeditions but often only as a side-project. Sergei Kharitonov has visited Medusa bay (73°21'N, 80°32'E) in western Taimyr, 17 km south of Dikson, several times since 1997, mainly to carry out research on geese, waders and gulls (eg, Kharitonov 2009). Bart Ebbinge has visited Mys Vostochny (in the mouth of the Pyasina river, 74°08'N, 86°43'E) in north-western Taimyr, 205 km east-northeast of Dikson, for a long-term research project on Darkbellied Brent Goose Branta bernicla in several years between 1990 and 2008 (eg, Ebbinge& Mazurov 2005-07). Klaas van Dijk (1993) and Holmer Vonk (1994) spent a breeding season at Mys Vostochny for research on waders as members of a delegation of the Foundation Working Group International Waterbird and Wetland Research (WIWO, see Vonk (2003) and van Dijk (2011)). Blood samples used in the genetic studies by Dorit Liebers refer to individuals from colonies at Mys Vostochny. The database of the Bird Ringing Centre of Russia was checked for relevant information. In addition, we used Filchagov et al (1992) and Rogacheva (1992) as general sources and checked all available reports and papers from recent expeditions. Unpublished data are incorporated as well. The description of the general appearance of adults is based on field observations and photographs of birds in the field as well as in the hand. Adults generally resemble Herring Gull L argentatus in size and shape. The upperparts coloration is darker than in Herring Gulls breeding in the Netherlands, being more similar to Yellow-legged Gulls L michahellis breeding in the Mediterranean. The legs are short to medium in length and rather firm. Most individuals exhibit dull yellows legs but variation is extensive, legs being pink or greyish in some individuals. The iris is pale yellow or ochre, with a variable amount of dark speckling. The orbital ring and gape are usually orange-red. The bill is relatively short, firm and rather blunt with a weak gonydeal angle and with an extensive red gonys spot restricted to the lower mandible. The wing pattern usually shows an isolated mirror in a largely black P10, relatively small apical spots to the outer primaries and dark markings extending to P4. There are some indications (Willems et al 2002; Pierre Yésou in litt) that adults at Medusa bay exhibit, on average, a darker mantle than birds at Mys Vostochny. In late June 2001, breeding adults at Medusa bay had started primary moult (P1-P2 shed). Details on morphometric characters of 24 ringed individuals (23 adults, 1 subadult) are presented in appendix 1. See Musch & Tinbergen (1996) for video images taken at Mys Vostochny in 1994-95 and see plate 21 (page 149) in Kennerley et al (1995) for a colour photograph of adults in a breeding colony in the estuary of the Nizhnyaya Taimyra river taken in 1990. Adults show variation in several field characters but assortative mating with regard to leg colour or any other characteristic was not observed during a detailed study at Mys Vostochny (Grabovsky 1991), and neither in various other colonies visited all over Taimyr (Filchagov et al 1992, Yésou 2002). In more recent years, there were also no indications for assortative mating in the colonies at Medusa bay and at Mys Vostochny (including 2008; Roeland Bom & Jim de Fouw pers comm). This means that we have no indications that two species breed on Taimyr (contra, eg, del Hoyo et al 1996). Taimyr Gulls breed all over Taimyr in colonies on islands along the coast, in inland areas along rivers and near lakes with islands and rocky outcrops, and in low densities on the tundra near small ponds. Filchagov et al (1992) estimated that 10 000-12 000 pairs breed on Taimyr with concentrations on islands in the estuary of the Nizhnyaya Taimyra river (c 1200 pairs) and on islands near Mys Vostochny. The islands near Mys Vostochny harbour the largest known colony with up to 2518 breeding pairs, counted in 2004. At least 180 pairs were counted in colonies along the eastern shore of the Yenisey bay around Medusa bay in 1999 (Willems et al 2002). A small island at Middendorf bay in northern Taimyr held a breeding colony of 100+ pairs in 1994 (Åke Lindström in litt). Highest numbers reported from eastern Taimyr are c 40 pairs around Pronchishcheva lake (75°16'N, 112°28'E) in 1991 (Spiekman & Groen 1993, Schekkerman & van Roomen 1995). Prokosch & Hötker (1995) mentioned that many birds were present nearly everywhere along the coast eastwards from Shturmanov (76°00'N, 96°30'E) in the second half of July 1989, but numbers were not indicated. July 2006, the mean clutch size at Mys Vostochny was 2.34, based on 1861 nests with at least one egg. In that year, the first egg hatching was registered on 11 July (326 checked nests) and six nests with hatching eggs were found on the next day (186 checked nests). In 2001, a year with very few lemmings, breeding phenology was intensively studied at Medusa bay. On 11 June, one completed nest and six initiated nests were found, and hatching started on 11 July. This all means that chicks born on Taimyr will be able to fly from around 10 August if we assume a fledging period of at least one month (Cramp & Simmons 1983). July onwards. Peters (2006) noted a sudden and strong southward movement at Medusa bay on 29 July 2001, which may have involved failed breeders. Obvious southward migration of 10s of gulls per hour was observed again from 3 August onwards. Between 1977 and 2008, c 750 Taimyr Gulls (c 680 chicks, c 75 adults and a subadult) were ringed with the majority at Mys Vostochny (c 465 chicks, c 42 adults and a subadult). Almost all adults were trapped on the nest. The adults were colour-ringed in 1995 (15 with red colour-rings with four digits), in 2005 (two) and in 2008 (c 12). At Medusa bay, 32 adults were trapped on the nest in 2001-02 and marked with orange wingtags. In 1977, c 20 chicks were ringed in the lower streams of the Bikada river, east of Lake Taimyr. Another 51 chicks were ringed in the estuary of the Nizhnyaya Taimyra river in 1990 (Prokosch & Hötker 1995). Finally, 143 chicks were ringed at Middendorf bay in 1994 (Grönlund & Melander 1995). As far as we know, no other significant ringing activities have taken place on Taimyr. Birds ringed in 1977 and after 2000 have been provided with metal rings issued by the Bird Ringing Centre of Russia (moskwa). Metal rings from foreign ringing schemes were used in 1990 (helgoland germania), 1991 (gdansk poland), 1993-94 (radolfzell germania), 1994 (stockholm sweden, Middendorf bay) and 1995 (copenhagen denmark). Note that almost 40% of the gulls were ringed in 1994, a lemming peak year, with 143 chicks ringed on 16 August at Middendorf bay and 150 chicks ringed between 5 and 10 August at Mys Vostochny. Almost all of these chicks had nearly fledged. Adults breeding at Medusa bay show a strong site fidelity to their breeding colonies and two marked adults were recorded many times in Dikson. There are no records of birds moving from colonies at Mys Vostochny to colonies at Medusa bay, or vice versa. A colour-ringed bird known as 'Red K015', trapped as breeding adult on the nest in 1995, was still recorded as a breeding bird at Mys Vostochny in 2006.
table 1 Details of long-distance ring recoveries of Taimyr Gulls taimyrensis ringed as chick (1-5) or as breeding adult (6) on Taimyr peninsula, Russia. Distances and directions based on constant geographical courses (loxodromes). Up to the end of 2010, the ringing activities have yielded six long-distance recoveries (table 1, figure 2; one sighting of a wing-tagged bird and five reports of birds found dead). Note that the recovery circumstances, including the date of recovery, of some might be less precise than shown in the table. Three birds (record 3-5) were reported from inland areas during autumn migration. Two of them (4-5) were recovered along the middle part of the Lena river near Yakutsk, a region where gulls do not winter. The recovery site of record 3, along a tributary of the Amur river and 400 km from the coast, is also unsuitable for wintering gulls. This individual was recovered 49 days after ringing and had flown 3331 km. Three birds were recovered from the surroundings of the Sea of Okhotsk. One (record 2) came from an island south of Magadan in September and was reported as a beached corpse (species not indicated), with an inaccurate finding date. 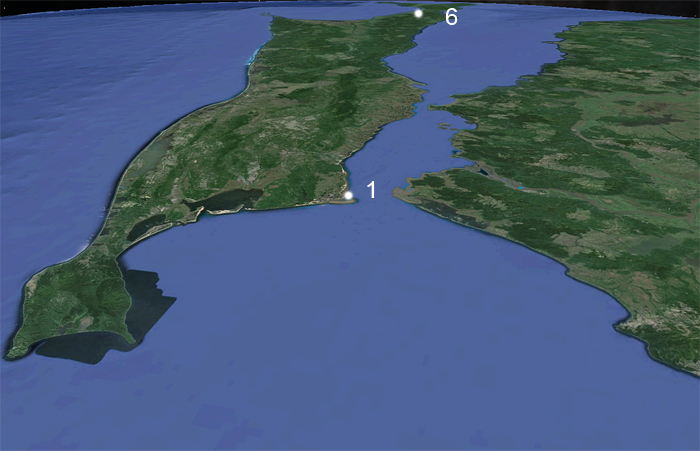 Two (record 1 and 6) were reported from Sakhalin. The first (1) was reported as having flown into wires on 5 November, 98 days after ringing, near Ribnovsk, close to the sea shore. The second (6) refers to a wing-tagged gull seen in southern Sakhalin, based on information sent by a hunter to the Bird Ringing Centre of Russia that a 'Herring Gull' with wing-tags was seen in the winter of 2001/02. More details are not available. We are not aware of other large white-headed gulls marked with orange or red wing tags in this part of Asia at that time. Japanese researchers, however, had just started a project on Black-tailed Gull L crassirostris breeding on islands in northern Japan close to Sakhalin, and they used red (Teuri island) and pale blue (Rishiri island) wing-tags with numbers in 2001, so confusion may have been possible. There are also two observations of Taimyr Gulls wearing a metal ring which could not be read (completely), an adult photographed in Pohang, South Korea, on 15 November 2001 (Michiaki Ujihara in litt), and a second calendar-year bird with a moskwa ring photographed at Choshi, Japan, in February 2007 (Andreas Buchheim in litt; one of 106 chicks ringed at Mys Vostochny in 2006). The number of recoveries is low but they show a strongly coherent pattern, indicating that Taimyr Gulls spend the winter along the Pacific coast of Asia. Looking south over Sakhalin Island; the narrow Tatarskiy proliv "Strait oif Tartars" separates the island, situated in the Sea of Ochotsk. There are only two true winter records - November to March - of ringed birds (record 1 and record 6 in table 1), both on Sakhalin island. The Bay of Bengal is situated due south of Taimyr but neither Cramp & Simmons (1983), del Hoyo et al (1996) nor Olsen & Larsson (2004) indicate that large white-headed gulls winter in substantial numbers in this area. This is supported by recent observations (Andreas Buchheim in litt, but see Li et al 2009). It is likely that the Himalayan mountains and the huge deserts north of it are a blockade for a direct north-south flyway for Taimyr Gulls. Moreover, all recoveries point at a south-easterly migration towards the wintering area. Three recoveries reveal that Taimyr Gulls occur inland during migration and all show that birds migrate to the wintering area by crossing the mainland of Asia. In particular record 4, a direct recovery of a firstwinter bird in October, is a clear demonstration of this migration pattern. A similar route is also very likely for record 3, a direct recovery of a firstwinter bird from an inland area in September, and for record 1, a direct recovery of a first-winter bird in early November. Rogacheva (1992) presents data on visible migration of 'Herring Gulls' near Mirnoye (62°18'N, 89°01'E), along the Yenisey river, 1300 km south-southeast of Dikson. During spring migration, 1000-2000 gulls were recorded yearly between 9-11 May and 3-5 June, with a peak in the last decade of May. Intensive autumn migration was seen on 27-28 September (1978) and on 12-15 October (1979). Gulls migrating along Mirnoye will pass the region of Lake Baikal and thus spend the winter in areas along the Pacific, as this route is the shortest and easiest way for migrating gulls towards a favourable wintering area. The most likely explanation is that the migrants at Mirnoye are Taimyr Gulls. Furthermore, Taimyr Gulls seen migrating southwards along Medusa bay in late-July and August could well concern individuals using the same migration route. To sum up, the available information indicates that Taimyr Gulls fly overland in a south-easterly direction towards the wintering area. It is very well possible that many individuals migrate along large rivers like the Yenisey and the Lena towards the Pacific. Several members of the assemblage of large whiteheaded gulls spend the winter along coasts of the north-western Pacific between the Bering Street in the north and Hainan in the south (Olsen & Larsson 2004, Li et al 2009), and our recoveries support sources like Il'icev & Zubakin (1990), Kennerley et al (1995), del Hoyo et al (1996), Lee et al (2000) and Shimba (2007) that Taimyr Gulls also winter in this region. The recoveries (figure 2) indicate that the Sea of Okhotsk might be an important wintering area but it is unclear whether this is indeed the case. Slaty-backed Gull L schistisagus is a common resident in this harsh region and Glaucous Gull L hyperboreus is a common winter visitor to the Sea of Okhotsk (Il'icev & Zubakin, 1990, del Hoyo et al 1996, Olsen & Larsson 2004). Furthermore, a large area of the Sea of Okhotsk is part of the winter range of the population of Vega Gull L (vegae) vegae breeding east of the Lena river (Olsen& Larsson 2004, see also Il'icev & Zubakin 1990). However, identification problems combined with a lack of ornithologists visiting large areas of the Sea of Okhotsk during winter (Kondratyev et al 2000, Li et al 2009) make it impossible to conclude if indeed significant numbers of Taimyr Gulls spend the winter here. We consulted Nial Moores and Michiaki Ujihara and both independently concluded (in litt) that what they call taimyrensis looks very similar to Taimyr Gulls photographed on Taimyr, based on similarity in structure, mantle colour and coloration of bare parts (see also Moores (2003) and Ujihara & Ujihara (2008)). Nial Moores noted that taimyrensis shows distinct differences in comparison with Vega Gull and Mongolian Gull L (vegae) mongolicus with regard to moult patterns and head streaking and in behaviour (cf Yésou 2001), and that first-winter birds and immatures can be easily distinguished as well. He considers taimyrensis a typical autumn and spring migrant in coastal waters around Korea, arriving in late September or early October, with a peak in October and in early November, and peaking again in March-April. Nial Moores stated that taimyrensis is a rather pelagic gull, feeding in large unmixed flocks around fishing boats in Korean waters of the Yellow Sea in March-April. Nial Moores indicated that the majority does not spend the winter in Korea but in areas further south and he roughly estimated that the total number spending the non-breeding season along the north-western coasts of the Pacific runs in the lower 10 000s. This estimate does not differ widely from the population size indicated by Filchagov et al (1992). Furthermore, Kennerley et al (1995) stated that Taimyr Gull is by far the most numerous large white-headed gull wintering in Hong Kong, usually present between late October and late March. During mid-winter, large white-headed gulls are relatively common in coastal areas in southern Korea and along the coast of China between the Yellow Sea and Hainan, including Taiwan (eg, Li et al 2009). Both Vega Gull and Mongolian Gull are regarded as rather common but there are no longdistance recoveries of Vega Gull, due to a lack of ringing in the breeding areas. In contrast, the Bird Ringing Centre of Russia has many recoveries of Mongolian Gulls, ringed by Sergey Pyzhyanov and co-workers at Lake Baikal (figure 3). Many recoveries are from coastal areas around the Yellow Sea, five birds were recovered from the direct surroundings of the Sea of Okhotsk, and some others were from sites in a direction towards the Sea of Okhotsk. These recoveries and recent observations in southern Korea of three wing-tagged Mongolian Gulls from breeding colonies in north-eastern Mongolia (Vogelwarte 45: 73, 2007) confirm that Mongolian Gull is a common visitor to coastal areas in China and Korea during the non-breeding season (contra Collinson et al (2008), but in support of Moores (2003) and Moores et al (2009)). Recent sightings of six other wing-tagged Mongolian Gulls (Andreas Buchheim in litt) underscore these findings. No ringed Mongolian Gulls have been recovered from Hong Kong and surroundings, with the nearest recovery 350 km north-east of Hong Kong. The lack of recoveries from coastal areas around the South China Sea fits with findings of Kennerley et al (1995) that Mongolian Gull is a scarce visitor to Hong Kong, outnumbered by Taimyr Gull by more than 20:1. Recent sources disagree about the current status of Taimyr Gull in Japan. Fujimaki et al (2000) and Lee et al (2000) state that Taimyr Gull does not occur in Japan but Olsen & Larsson (2004), on the other hand, suggest that they probably mainly winter in Japan. Ujihara & Ujihara (2008) present several photographs, all taken in Japan. Hoogendoorn et al (1996) have made detailed studies of large white-headed gulls wintering in southern Japan. They showed that c 5-10% must be attributed to Taimyr Gull and they stated that Taimyr Gull occurs less regularly in more northern regions during winter. Gibbins (2003) studied large white-headed gulls wintering at Choshi near Tokyo, and concluded that c 5% fell outside the range of Vega Gull and Mongolian Gull and very likely had to be attributed to Taimyr Gull. Besides that, Hoogendoorn et al (1996) suggested that Mongolian Gull is probably scarcer in Japan than Taimyr Gull, which is supported by the recoveries in figure 3, as to date no gull ringed at Lake Baikal has been recovered in Japan. None of the wingtagged Mongolian Gulls has been observed in Japan either (Andreas Buchheim in litt). Our ring recoveries indicate that Taimyr Gulls spend the winter in coastal areas in the northwestern Pacific and that they cross the mainland of Asia in a south-easterly direction when migrating from the breeding grounds towards the wintering areas. The number of recoveries is low but this is, eg, also the case for almost all species of waders breeding on Taimyr (Tomkovich et al 2000). We have some indications, but no ring recoveries, that Taimyr Gulls might predominantly winter in a quite mild environment, most likely in coastal areas of the East China Sea and the South China Sea. More observations of birds marked on Taimyr and more insight in the winter ecology are needed to establish its core winter range and to get a better picture of the migration route. Furthermore, observations of marked birds are necessary to clarify if Taimyr Gulls also spend the winter in coastal areas around the Arabian Sea, or elsewhere along a southwesterly flyway. Recent sources indicate that gulls resembling Taimyr Gulls spend the winter in low numbers in southern Iran (Scott 2007) and Bahrain (Yésou & Hirschfeld 1997). The same may be true for the small number of unidentified large white-headed gulls seen at Okha, western India, described and depicted in Buchheim (2006). We are grateful to all those who were involved in the organisation and logistics or helped obtaining data in the field. The Dutch government gave prolonged financial support to many expeditions to Taimyr. The manuscript greatly benefited from the help of, in particular, Roeland Bom, Andreas Buchheim, Fred Cottaar, Jim de Fouw, Ted Hoogendoorn, Peter de Knijff, Åke Lindström, Nial Moores, Rudy Offereins, Leon Peters, Norman van Swelm, Michiaka Ujihara, Ruud Vlek, Rik Winters and Pierre Yésou. Joop-Niek IJnsen kindly prepared the maps. All photographers are acknowledged for the permission to use their photographs. Buchheim, A 2006. Adult large white-headed gulls at Okha. Birding Asia 5: 40-53. Collinson, M, Parkin, D, Knox, A, Sangster, G & Svensson, L 2008. Species boundaries in the Herring and Lesser Black-backed Gull complex. Br Birds 101: 340-363. Cramp, S & Simmons, K (editors) 1983. The birds of the Western Palearctic 3. Oxford. van Dijk, K 2011. Breeding ecology of waders and other birds at Mys Vostochny in 1993. WIWO-report 88. Nijmegen. Ebbinge, B & Mazurov, Y 2005-07. Pristine wilderness of the Taimyr peninsula. Report 2004-06. Moscow. Filchagov, A, Yésou, P & Grabovsky, V 1992. Le Goéland du Taïmyr: répartition et biologie estivales. L'Oiseau et RFO 62: 128-148. Fujimaki, Y, Kawaji, N, Morioka, H, Urano, E & Yanagisawa, N 2000. Check-list of Japanese birds. Sixth edition. Tokyo. Glutz von Blotzheim, U & Bauer, K (editors) 1982. Handbuch der Vögel Mitteleuropas 8/I. Wiesbaden. Grant, P J 1982. Gulls: a guide to identification. Calton. Grönlund, E & Melander, O 1995. Swedish-Russian tundra ecology expedition 1994. Report. Stockholm. del Hoyo, J, Elliott, A & Sargatal, J (editors) 1996. Handbook of the birds of the world 3. Barcelona. Il'icev, V & Zubakin, V 1990. Handbuch der Vögel der Sowjetunion 6/1. Wittenberg. Kennerley, P, Hoogendoorn, W & Chalmers, M 1995. Identification and systematics of large white-headed gulls in Hong Kong. Hong Kong Bird Rep 1994: 127-156. Kharitonov, S 2009. Breeding site fidelity and foraging pattern in Taimyr Gull in the Medusa bay vicinities. Mat Scien Conf Problems of animal study and protection in the north Syktyvkar: 221-222. Kondratyev, A, Litvinenko, N & Kaiser, G 2000. Seabirds of the Russian Far East. Report. Ottawa. Lee, W, Koo, T & Park, J 2000. A field guide to the birds of Korea. Seoul. Li, D, Bloem, A, Delany, S, Martakis, G & Quintero, J 2009. Status of waterbirds in Asia in 1987-2007. Wetlands International report. Kuala Lumpur. Liebers, D 2000. Phylogeographische Differenzierung und Verwandtschaftsbeziehungen von Großmöwen. PhD-thesis. Greifswald. Liebers, D, Helbig, A & de Knijff, P 2001. Genetic differentiation and phylogeography of gulls in the Larus cachinnans-fuscus group. Mol Ecol 10: 2447-2462. Liebers, D & Helbig, A 2002. Phylogeography and colonization history of Lesser Black-backed Gulls as revealed by mtDNA sequences. J Evol Biol 15: 1021-1033. Liebers, D, de Knijff, P & Helbig, A 2004. The Herring Gull complex is not a ring species. Proc R Soc Lond B 271: 893-901. Moores, N, Park J & Kim, A 2009. The Birds Korea checklist 2009. Busan. Musch, J & Tinbergen, T 1996. Onze Rotgans in Siberië. Video. Wageningen. Olsen, K M & Larsson, H 2004. Gulls of Europe, Asia and North America. Second edition. London. Peters, L 2006. Bird migration at Medusa bay in JuneAugust 2001. Student report. Groningen. Prokosch, P & Hötker, H 1995. Faunistik und Naturschutz auf Taimyr. Corax 16: 1-264. Rogacheva, H 1992. The birds of central Siberia. Husum. Schekkerman, H & van Roomen, M 1995. Breeding waders at Pronchishcheva Lake in 1991. WIWO-report 55. Zeist. Scott, D 2007. A note on large white-headed gulls in Iran. Podoces 2: 143-145. Shimba, T 2007. A photographic guide to the birds of Japan and north-east Asia. London. Spiekman, H & Groen, N 1993. Breeding performance of arctic waders in relation to lemming densities in 1992. WIWO-report 33. Zeist. Tomkovich, P, Lappo, E & Syroechokovski, E 2000. Ringing and migratory links of Taimyr waders. Heritage of the Russian Arctic: 458-475. Vaurie, C 1965. The birds of the Palearctic fauna. A systematic reference. Non-Passeriformes. London. Vonk, H 2003. Breeding birds at Mys Vostochny in 1994. WIWO-report 52. Zeist. Willems, F, van Turnhout, C, van Kleef, H & Felix, R 2002. Breeding birds of Medusa bay in 1998 and 1999. WIWO-report 77. Zeist. Yésou, P 2001. Phenotypic variation and systematics of Mongolian Gull. Dutch Birding 23: 65-82. Yésou, P 2002. Systematics of Larus argentatus-cachinnans-fuscus complex revisited. Dutch Birding 24: 271-298. Yésou, P & Hirschfeld, E 1997. Which large gulls from the Larus fuscus-cachinnans-argentatus complex occur in Bahrein? Sandgrouse 19: 111-121.
bending toes back to c 90° and from this bend to notch on back of intertarsal joint. Weight in grams, other measurements in mm. Coloration of iris is estimate of % dark on pale yellow basis. V = Mys Vostochny, M = Medusa bay, 5-22 trapped by SK on nest on Oleni islands (measurements taken by Oscar Langevoord and Leon Peters); 1-3 from Prokosch & Hötker (1995); 4 accidently caught in trap for foxes; 2 aged as third calendar-year (all others as after third calendar-year). Ringing schemes: DFH = helgoland germania, DFR = radolfzell germania, RUM = russia moskwa. Heuglini adult, October 31 2009, Ashdod, Israel. Picture: Amir Ben Dov. Heuglini adult, October 10 2009, Ashdod, Israel. Picture: Amir Ben Dov. Heuglini adult, October 24 2010, Oman. Picture: Aurélien Audevard. Heuglini adult, October 02 2009, Ashdod, Israel. Picture: Amir Ben Dov. Heuglini adult, October 07 2011, Ashdod, Israel. Picture: Amir Ben Dov. Heuglini adult, October 12 2011, Ashdod, Israel. Picture: Amir Ben Dov. Figure 1 Taimyr Gull taimyrensis: Map of Taimyr peninsula, central Siberia, Russia. Figure 2 Taimyr Gull taimyrensis: Recovery sites of Taimyr Gulls taimyrensis ringed on Taimyr peninsula, Russia. Figure 3 Taimyr Gull taimyrensis: Ringing and recovery sites. Plate 3 Taimyr Gull taimyrensis adult, July 08 1991, Bird Islands, Mys Vostochny, Taimyr, Russia, (74°07'N, 86°37'E). Picture: Jan van de Kam. Plate 4 Taimyr Gull taimyrensis adult, July 08 1991, Bird Islands, Mys Vostochny, Taimyr, Russia, (74°07'N, 86°37'E). Picture: Jan van de Kam. Plate 5 Taimyr Gull taimyrensis, August 09 2006, Bird Islands, Mys Vostochny, Taimyr, Russia, (74°07'N, 86°37'E). Picture: Bram Feij. Plate 6-7 Taimyr Gull taimyrensis, July 22 2008, Bird Islands, Mys Vostochny, Taimyr, Russia, (74°07'N, 86°37'E). Picture: Jim de Fouw. Taimyr Gull taimyrensis adult, July 2005, Pyasina, Taimyr, Russia (74°09'N, 85°36'E). Picture: Raymond Klaassen. Plate 8 Taimyr Gull taimyrensis adult, August 09 2006, Bird Islands, Mys Vostochny, Taimyr, Russia, (74°07'N, 86°37'E). Picture: Bram Feij. Plate 9 Taimyr Gull taimyrensis adult, August 09 2006, Bird Islands, Mys Vostochny, Taimyr, Russia, (74°07'N, 86°37'E). Picture: Bram Feij. Plate 10 Taimyr Gull taimyrensis adult, June 22 2005, Bird Islands, Mys Vostochny, Taimyr, Russia, (74°07'N, 86°37'E). Picture: Vasily Grabovsky. Plate 11 Taimyr Gull taimyrensis adult, July 17 2008, Mys Vostochny, Taimyr, Russia, (74°07'N, 86°37'E). Picture: Laurent Demongin. Plate 12 Taimyr Gull taimyrensis RUM DS006503 adult male, June 25 2001, Oleni islands, Medusa bay, Taimyr, Russia, Russia (72°25'N, 77°40'E). Picture: Leon Peters. Taimyr Gull taimyrensis chicks, August 09 2006, Bird Islands, Mys Vostochny, Taimyr, Russia, (74°07'N, 86°37'E). Picture: Bram Feij. Plate 14 Taimyr Gull taimyrensis adult, July 13 2007, Mys Vostochny, Taimyr, Russia, (74°07'N, 86°37'E). Picture: Gerard Müskens. Plate 15 Taimyr Gull taimyrensis adult, July 17 2008, Mys Vostochny, Taimyr, Russia, (74°07'N, 86°37'E). Picture: Laurent Demongin. Taimyr Gull taimyrensis adult, January 25 2012, Jinzhou Bay, Dalian, China (38°56'N, 121°37'E). Picture: Terry Townshend. Taimyr Gull taimyrensis adult, December 10 2008, South Korea. Picture: Aves Korea. Taimyr Gull taimyrensis adult, December 31 2005, South Korea. Picture: Han-soo Sea. Taimyr Gull taimyrensis adult, February 22 2013, South Korea. Taimyr Gull taimyrensis adult, April 23 2012, Gunsan, South Korea. Picture: Bak-heon Woo. Taimyr Gull taimyrensis adult, April 10 2011, South Korea. Picture: K.S. Shim. Taimyr Gull taimyrensis or Birula Gull Larus (vegae) birulai adult, November 26 2013, Kanto, Japan. Picture: Strix. Taimyr Gull taimyrensis or Birula Gull Larus (vegae) birulai adult, November 14 2014, Kanto, Japan. Picture: Strix. Taimyr Gull taimyrensis 1CY, December 10 2008, South Korea. Picture: Aves Korea.